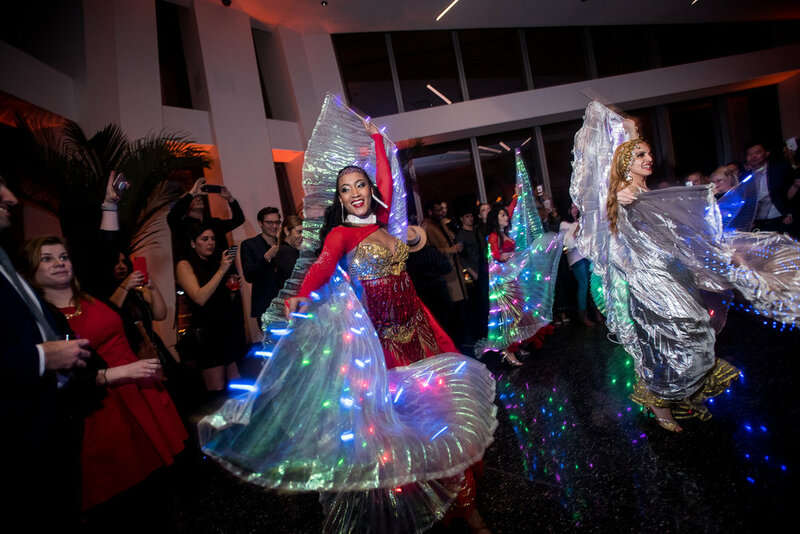 Earlier this month the One World Observatory, in a night we will never forget, UrbanDaddy x Emirates Airlines held a star studded night of cultural entertainment and delicious fare. Starting off in New York City, we departed at approximately 8 PM for a record trip around the globe to Milan, Singapore, and Dubai, before return back to the top of the One World Trade Center just before midnight. SHIEN Artists had the pleasure of providing all of the in flight entertainment! Harlequin Stiltwalkers poured champagne all the way through the trip to Milan. In Singapore, the traditional Chinese Lion Dancers danced through the people and surprised them with a traditional lettuce feeding ritual for good luck. Belly Dancers entranced the crowds in Dubai with their LED Wings & Sabre Balancing. Even a Snake Charmer made an appearance, charming guests and beasts alike.